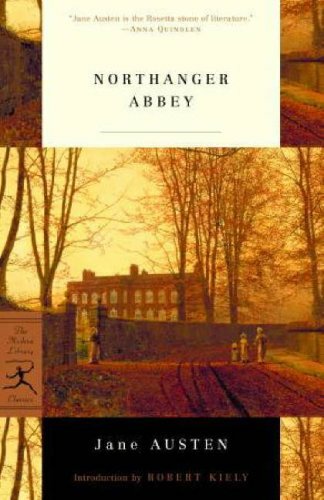 Northanger Abbey is one of Jane Austin’s lesser known novels. My suspicion is that people mostly pick it up to read because they liked Pride and Prejudice and want something similar. But Northanger Abbey isn’t really like Pride and Prejudice. Yes, the setting and culture is the same. But Pride and Prejudice is perfect – hot guy meets witty girl and we all sigh when they fall in love. Near-perfect writing too. It is almost impossible to not like Pride and Prejudice unless perfection makes you bitter. Northanger Abbey is a different sort of book. It is a romance story but the point of the story isn’t the romance, the point of the story is to slyly poke fun at the sorts of things which happen in novels. The story begins by introducing Catherine, a perfectly ordinary girl. She lives in the country with her big family. Her father is a preacher. The book points out that she is ordinary, and that this makes her different from most heroines. Then, Catherine gets an invitation to go to a city called Bath. There she has more adventures than she did at home. She makes friends with a girl who is quite flighty and silly, though Catherine does not realize it at the time. She also meets a guy named Mr. Tilney whom she gets a crush on. Note: Her flighty silly friend gets her to start reading these really exciting gothic novels full of sensation. Another note: The author keeps informing us of ways in which the things that happen to the heroine are different than things which usually happen to heroines. It is always pointed out in a very humorous way. After a while, Catherine begins to make friends with Mr. Tilney’s sister, which is a much more mature person than her other friend. She grows up somewhat, and Mr. Tilney’s sister invites her to spend some time with them at their home, Northanger Abbey. Hence the title of the book, Northanger Abbey. Also, oooooh, romance begins to brew. Because, you know, she is under the same roof as Mr. Tilney and she has a huge crush on him. So Catherine goes to this huge old Abbey to spend time with her friends. It is big and creepy, just like the houses in the Gothic novels she has been reading. She begins to suspect that some really fascinating and horrible things have happened at that Abbey. She actually convinces herself of some of it, and then gets horrible embarrassed when she realizes that none of it is true, that her overactive imagenation made it up because of the books she’d read. However, these experiences cause her to grow up a bit, and Mr. Tilney…. Never mind. Read the book yourself. It is mostly interesting because of the way it pokes fun of “other books.” However, since the books of Jane Austin’s day were different than the books of today, it also provides an interesting glimpse of what books in her day were like. After I read this review, I remembered that I had a book of all Jane Austen’s novels, and I started reading Northanger Abbey. It’s so good! I love the tongue-in-cheek humor.